Since I’m trying to make healthy recipes that also count as comfort foods and tasty dinners, this recipe ended up as a triple winner. My husband actually went back for seconds and I had another serving for breakfast… that, for me, makes this dinner even better. Aren’t we always looking for a new and unique meatloaf recipe? This one definitely earned a gold star in my book. I started with a package of ground turkey. NOTE: I like using ground turkey instead of ground beef in most of my recipes because I think it takes flavors better and more thoroughly than beef… but you should feel free to use whatever sort of ground meat you like best. I placed the thawed meat in a bowl and added a palmful of parmesan cheese, a half an onion (diced), 1/3 an apple (diced), two cloves of garlic (diced fine), a big squirt of horseradish mustard, some red wine (I love using James River Cellars’ Rad Red or Boordy’s Petite Cabernet for this sort of dish), and seasonings (I used herbs de provence and salt/pepper). I also needed some breadcrumbs, and I didn’t have any on hand, so I diced four pieces of toast and added that to the mixture as well. Once everything was in my bowl, I gently blended it all together with my hands… best tools ever! I like to change up how I form meatloaf patties from time to time, but I decided that I’d go “old school” and just bake this recipe in a traditional loaf pan. Since I didn’t have ketchup in the fridge (I’m going to have to get some at the store the next time I go), I spooned a bit of spaghetti sauce over the top of my meatloaf and then sprinkled it with a bit of sugar to replicate the taste of ketchup. Once baked (in a 375 degree oven for an hour), I found this dish to be thoroughly cooked, yet still moist enough to be flavorful. I loved it. 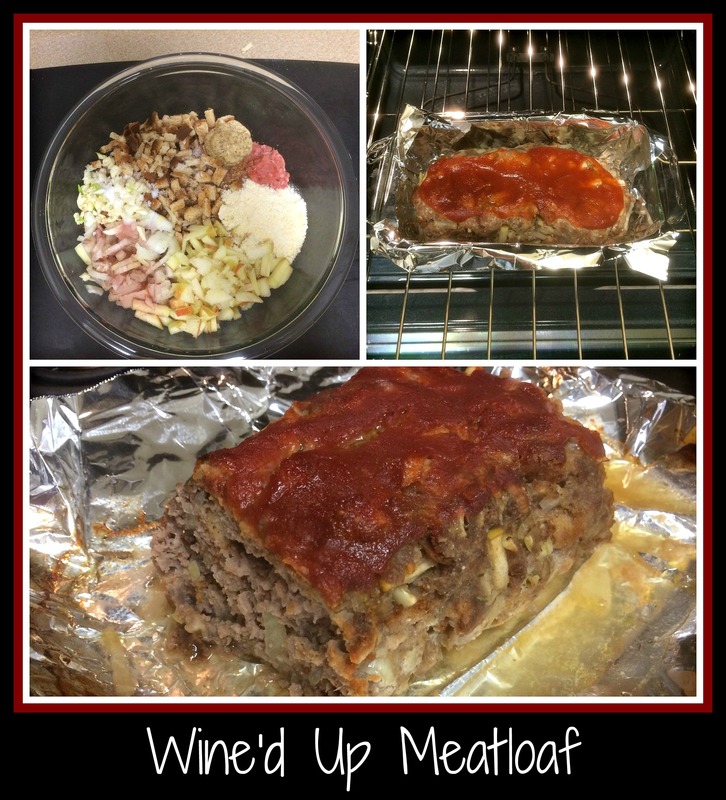 Meatloaf is a fun recipe to use when you’re feeling creative. I don’t always use horseradish mustard… I rarely use apple… it’s just a great way to play with different ingredients to make a delicious meal. Try it sometime and let me know what you think… It’s fun! This entry was posted in Cooking, Cooking Challenges, Recipe, Wine and tagged Boordy Petite Cabernet, comfort food, easy dinner, James River Cellars Rad Red, meatloaf, red wine.